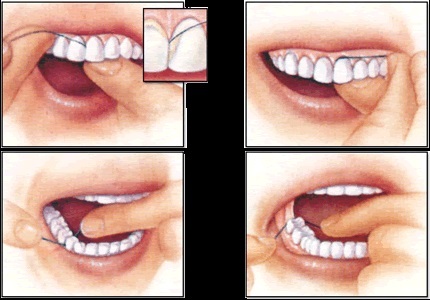 Flossing is the toothbrush for between your teeth, below the gums, and behind the very last tooth of your mouth. The American Dental Association recommends cleaning between your teeth daily with an interdental cleaner (like floss). Cleaning between your teeth may help prevent cavities and gum disease. Cleaning between your teeth helps remove a sticky film called plaque. Plaque contains bacteria that feeds on leftover food or sugar in your mouth. When that happens, it releases an acid that can eat away at the outer shell of your teeth and cause cavities. Plaque that is not removed by brushing and cleaning between your teeth can eventually harden into a rough substance called tartar (or calculus). Tartar collects along your gum line and can lead to gum disease. Once tartar forms, only your dentist can remove it. We know we should floss at least once a day, but not everyone knows the right way to do it. Use this step-by-step guide to find out how to properly floss your teeth.